Get Ready, Get Set, NOAC 2015! Here we go. It is time to begin planning our trip to the 2015 National Order of the Arrow Conferences. Pack your bags, grab your buddies and get ready for the biggest event in the Order. From August 3 through August 8th, 2015 more than 10,000 Arrowmen from across the country and around the world will gather at Michigan State University in East Lansing, Michigan. Here we will be celebrating the 100the anniversary of the Order of the Arrow. Twelve contingent members of Orca Lodge attended the National Order of the Arrow Conference (NOAC) held at Michigan State University. 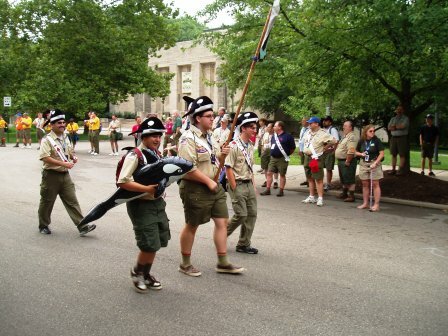 In addition, five Orca arrowmen were selected for NOAC staff. Approximately 7,200 Arrowmen from all 50 states attended.The theme of the conference, “United, We Leave a Legacy", was shared thru-out the program, including the trainings, and the evening entertainment. In addition, 2012 marked 100 years since the first Eagle Scout was awarded, and the conference worked with NESA to commemorate this occasion. Ten contingent members of Orca Lodge attended the National Order of the Arrow Conference (N OAC) held at Indiana University. In addition, six Orca arrowmen were selected for NOAC staff. Approximately 7,200 Arrowmen from all 50 states attended.The theme of the conference, “The Power of One", focused on the power that we individually have to make changes for good. Following examples given of people in the past, it was stressed that this is OUR time. We were challenged: “If not me, then who? And “If not now, then when?The week’s schedule was crammed. For example, sessions in insightful leadership training, fun events (scuba, rock climbing, car bashing), activities (regional dodge ball, indoor and outdoor sports), patch trading every where, the trading post, religious services, native American instruction and competitions in drumming and dancing, the O.A. museum, hot air balloons and fellowship. The evening shows in the large inside arena were preceded by over 7,000 crazy arrowmen jumping and cheering for choice seats and for free t-shirts that were shot into the audience. The final day, Founders’ Day, began with a parade, and was followed by over thirty games for fun and team building and lodge booths. 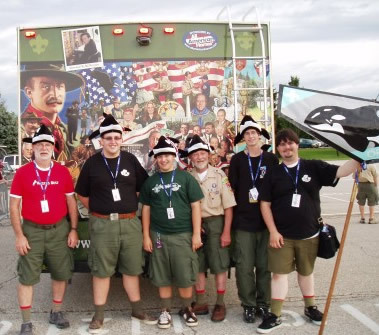 With an official of the Guinness Book of World Records present for verification, the NOAC set a new world record for the largest kazoo band: over 4,000 players. The final evening’s show concluded a fantastic conference with everyone singing the inspirational O.A. song followed by over 300 gallons of ice cream.